The advance of variable speed drives systems (VSDs) engineering highlights the need of specific technical guidance provision by electrical machines and drives manufacturers, so that such applications can be properly designed to present advantages in terms of both energy efficiency and expenditure. 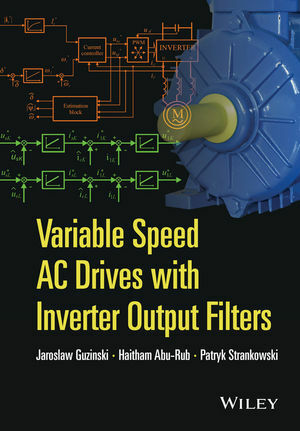 This book presents problems and solutions related to inverter-fed electrical motors. Practically orientated, the book describes the reasons, theory and analysis of those problems. Various solutions for individual problems are presented together with the complete design process, modelling and simulation examples with MATLAB/Simulink on the companion website. A key focus of Variable Speed AC Drives with Inverter Output Filters is to examine the state variables estimation and motor control structures which have to be modified according to the used solution (filter). In most control systems the structure and parameters are taken into account to make it possible for precise control of the motor. This methodology is able to include modifications and extensions depending on specific control and estimation structures. Highly accessible, this is an invaluable resource for practising R&D engineers in drive companies, power electronics & control engineers and manufacturers of electrical drives. Senior undergraduate and postgraduate students in electronics and control engineering will also find it of value. Dr Guzinski is currently an adjunct with the Faculty of Electrical and Control Engineering at Gdansk University of Technology. Dr Guzinski is the author and co-author of more than 100 papers presented in journals and conferences and the co-author of High Performance Control of AC Drives with Matlab/Simulink Models (John Wiley & Sons, 2012). Professor Abu-Rub has worked in the academic field and has been an active expert in electric drives for almost 20 years. He joined Texas A&M University at Qatar in 2006 and teaches a course on electrical drives to graduate and undergraduate students. He has published around 80 journal and conference papers, has co-authored four lab manuals, and reviewed a significant number of scientific papers and projects. Professor Abu-Rub is also a co-author of High Performance Control of AC Drives with Matlab/Simulink Models (John Wiley & Sons, 2012). Patryk Strankowski is currently working towards his Ph.D. degree in monitoring and diagnosis of electrical drives at the Gdansk University of Technology in Poland.